Washington Sq Park Phase II Up Next! Work on Phase II began Fall 2009 and is scheduled to be completed Fall 2010. Note: as of early 2011, the work is scheduled to be completed in Spring 2011. Part of Phase II (Large Dog Run and Mounds) has been moved into Phase III. Phase II of Washington Square Park’s redesign will focus on the Eastern and Southwestern sections of the Park and will see dramatic changes to : the Garibaldi Plaza, the “Teen Plaza” / Performance Area(no more Teen Plaza, basically, and a big circle will encompass Garibaldi, who will be moved, the stage will be lowered), the Dog Runs(moved to the southern rim of the park), the Chess Area (same # of chess tables but the area will be reduced), the “Mounds”(will be redone and lowered basically so they are less in view and artificial turf will surround them) and more! A positive has been the Parks Department’s agreement to preserve four (of six) of the Park’s seating alcoves — one reconfigured on the Southeast side while the two on the East side and the one on the Northeast side of the Park will be preserved as they currently are. Phase III (projected date of work unknown) will encompass the comfort stations/bathrooms and the maintenance buildings on the South side of the Park. An argument could also be made for modification of the plan at this point, given budgetary and other constraints in this climate. The original budget for all three phases of Washington Square Park’s reconstruction work was approved by the NY City Council at $16 million. Phase I of the project (which opened May 2009) ended up cost $13 million Update: $16 million ! and Phase II was estimated earlier this year at $14 million (Update: Bid came in at $9 million but let’s see the final numbers…). Adding in Phase III, we will see the original approved budget of $16 million likely doubled. It’ll be interesting to see what kind of NYC Parks Department and NY City Council oversight we might see in relation to this in the future. I posted more than usual today (see below) in anticipation of taking the next few weeks off beginning tomorrow, July 15th until Monday, August 10th — barring any breaking news! Please send in any tips. I’ll still check them. You can also follow me on twitter. There’s now a Contact button at the top of the Site and if you want to be apprised if I post something (if you’re not already getting the blog via FeedBurner), send me a note via the form there and I will notify you. See you soon! Alright, there wasn’t really a demolition going on at that moment but you get the idea and can add your own caption. No new posts today but I have a few in store for tomorrow, Tuesday 7/14. Then I’m taking a blogging break from Wednesday, July 15th to Monday, August 10th. (If some really key news occurs, I will post it here.) Check back tomorrow! 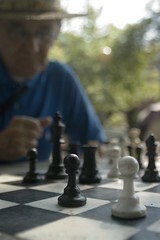 Beginning Today — Free Chess Lessons at Washington Square Park! This program is co-sponsored by Chess-in-the- Schools, the Friends of Washington Square Park and the City of New York Parks and Recreation. Will Joe Jr.’s, Village Institution for 35 years, close Sunday? I went in Joe Jr.’s restaurant about four months ago, inspired I think by Vanishing New York’s previous coverage of this Village institution (same location for 35 years). It’s a real old school New York place located at Sixth Avenue and 12th Street. I sat at a booth. It was really comfortable. I ordered something diner-y, like a grilled cheese and unsweetened iced tea. They couldn’t have been nicer. It wasn’t expensive. Sort of a throw back to how things can be, and were, in NYC. It’s not glitzy by any means and you’re not going to get the best gourmet meal but not everything has to be about shiny glass buildings and chi chi wine bars and Duane Reade’s on every corner and Wall Street myopia in New York City. The ‘other’ is what makes New York complete and unique and what it’s renowned for … art and politics and community and grit and controversy and being on the f**king cutting edge … not wiping out all of its past and its future. It’s something people like Mike Bloomberg say they understand (at least in campaign ads – where he’s all about the ‘average’ New Yorker and supporting small businesses) but so don’t. After all, actions speak louder than words. And it is Mike Bloomberg’s actions that are making the ‘other’ New York, places like Joe Jr’s, capsize and disappear. Read Jeremiah’s Vanishing New York Blog piece today to hear the latest on Joe Jr.’s. It’s another story of a landlord, greed, a lost lease. There’s a petition in the restaurant… perhaps venture by to sign it. Note: Joe Jr.’s did indeed close that Sunday.